It was an article in the 28 November 1948 British Sunday newspaper "The People" that would describe the task faced by the Search Officers as "the greatest detective job in the world." Pathology was in its infancy and DNA undreamed of, and sometimes several exhumations would be needed as slender clues were sought which may lead to the identification of bodies which has suffered severe trauma and remained buried many years. The location of the crash site was typically hazy and could cover a widespread area. Simply searching along the planned route would most likely be a waste of time; the missing aircraft could be dozens of miles to either side. Unlike land warfare, with air warfare, there are no front lines. Sweeps or chases could quickly degenerate into chaotic chases over miles of countryside straying miles from the recorded area of operations almost always a long way from friendly territory and friendly witnesses. After dark, night navigation was even harder. In the early years of the war it was rudimentary, based upon dead reckoning and celestial readings. In the later war years with the introduction of lattice networks of radar beams, a fault with the rudimentary equipment, a cloudy night, or the slightest variation in wind direction or strength from the forecast could see aircraft scattered over a vast area. Then there was the human factor– the merest mathematical miscalculation, or slip in pilot concentration, could have drastic results. A mistake of half a degree – a pencil’s width drawn on the navigator’s map – could see an aircraft drifting miles off course. Evidence on the spot was usually inadequate. Aircraft crashes particularly with heavy fuel or bomb loads, leave little in the way of coherent wreckage. Wreckage could have been cleared for recycling or left in situ. Bodies, which would have suffered severe trauma, were sometimes buried with honors, sometimes buried in haste at the crash site, and sometimes simply left in the wreck. Little effort was made to identify or even separate the bodies found. There was also the confusion factor. It was not uncommon for wrecks of aircraft whose pilot had a known grave to find remainder of limbs or lower torsos still in them. In the Hurricane for example the fuel tank was right in front of the pilot centering any explosion just a few inches from the pilot, disarticulating any remains. The question that confronted the search officer; was this a new case or a case where a pilot had already been removed and properly buried? 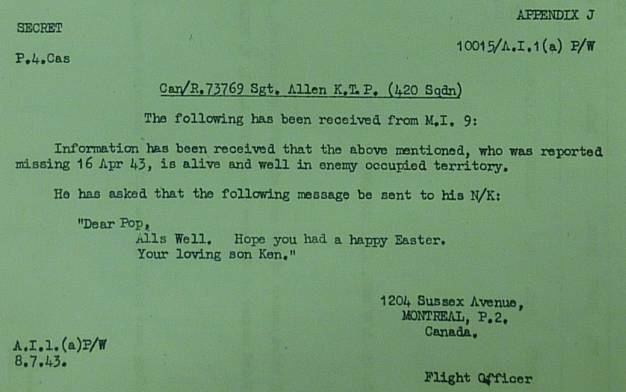 Further there were cases (see example following message) where an aircrew was thought to be missing and turned up very much alive! Fires or the aircraft impact could easily destroy or obscure the serial numbers on an aircraft, particularly on the canvass covered fuselage of the Hurricane. The fiber identification tags worn by every serviceman were known to be highly flammable. Timing and particular quickest response was important before all clues were obliterated and local inhabitants forget or loose interest in key evidence. The above was done to the backdrop of: wrecks often containing unexploded ammunition or occasionally bombs; work conditions for the MRES Search Officer task involved long hours, often seven days a week, in arduous conditions.